Made of oxidized silver, plated with 24k gold and featuring a dazzling garnet - this fantastic pair of earrings is the perfect gift for someone special, and an appropriate gift for any occasion. Both stylish and classy, these great earrings suit just about any taste, and are sure to thrill the lucky recipient. These post-style silver earrings utilize the effect of the garnet, plated gold and different shades of silver to form an intricate, beautiful piece of gold-silver jewelry. Whether you're celebrating a birthday, graduation, anniversary, mothers’ day or just want to say I love you, you’ve come across the perfect gift for someone very close to your heart. Idit Jewelry has crafted a masterful pair of oxidized silver and gold earrings which is guaranteed to please. Oxidized silver jewelry is fast becoming the latest fashion, as more and more jewelry makers are utilizing it in their craft. After oxidation of silver takes place, the silver takes on a smoky and slightly blackish look, and reveals shades of different colors such as blue, red and gray when viewed under a direct light. The oxidation created a unique look that is very trendy, but can also be incorporated into classy, dressy jewelry. 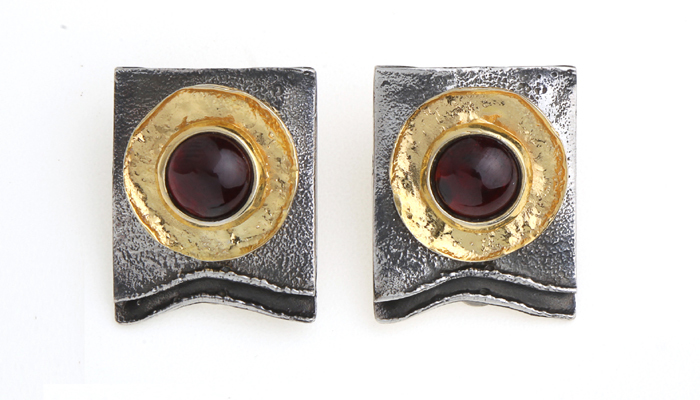 These rectangular (2.4cm x 1.8cm (1 inchx7/10 inch)) oxidized silver earrings feature a circular plate of 24k gold set in the middle of the rectangle, and set in the center of the gold plate is a beautiful garnet. The bottom of the rectangle is slightly curved upwards, with the silver directly above it more heavily oxidized in a wavy shape, creating a stunning, intricate finish to each beautiful earring. The rest of the earring is less oxidized, forming a remarkable contrast between the shiny and darkened silver. The edges of the golden plate are curved slightly outwards, while the garnet shines proudly from its central location. Appropriate both for dressy events and for more casual settings, this great set of oxidized silver earrings is a wonderful addition to any jewelry box, and a great complement to any collection of gold jewelry, silver jewelry or garnet jewelry.